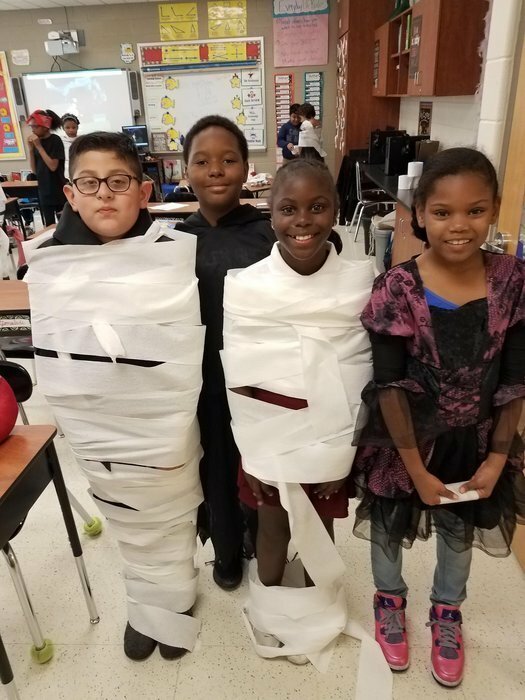 Lansing School District has started a new tradition! 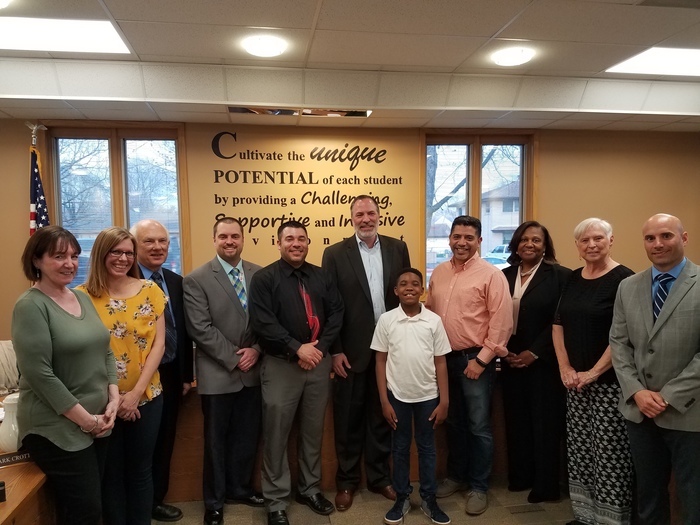 At the April 17 Board Meeting, a student led the Pledge of Allegiance. This is Philip Dickey, a fourth grader in Mrs. Rhodes's class at Reavis. 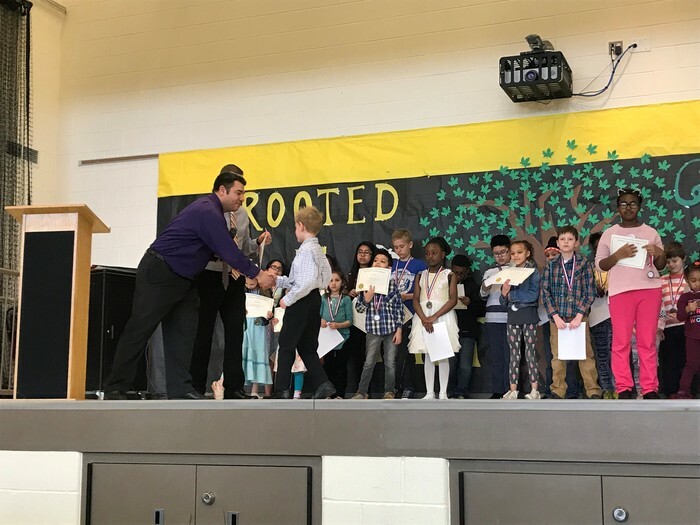 Philip is an Honor Roll student, consistently demonstrates kindness and caring for others, asks a lot of questions and is an active participant in class, and is a member of the PBIS Student Leadership Team. We are hoping to have other students lead the Pledge at future Board Meetings. Great job Philip! 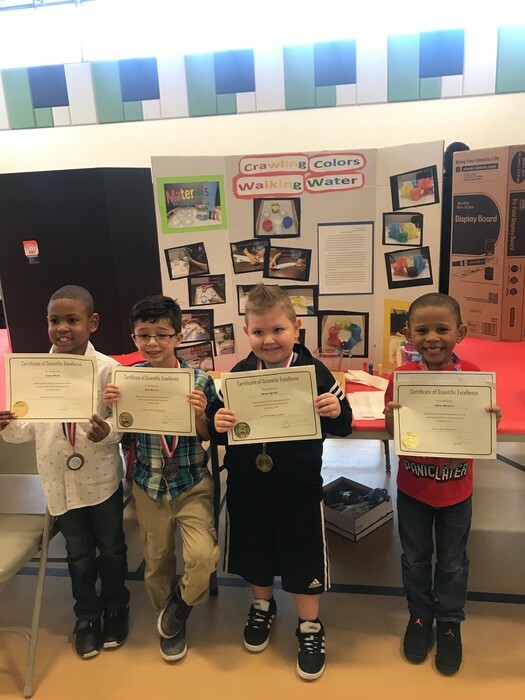 Lansing School District 158's Annual Elementary Science Far was held at Oak Glen on Saturday, April 6. 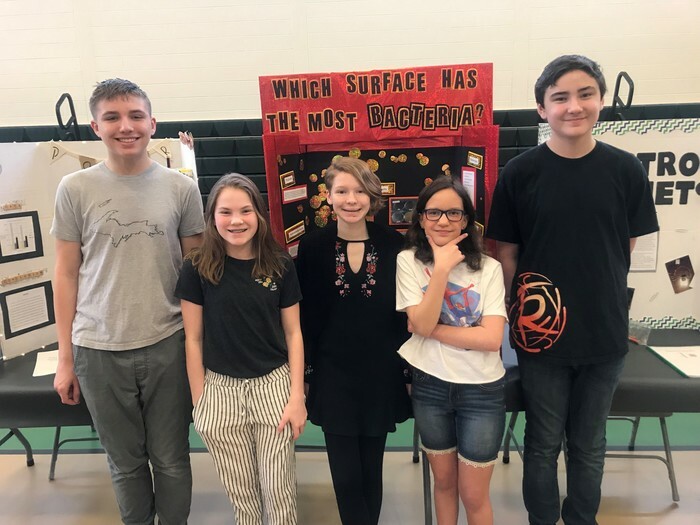 Congratulations to all students who participated and thanks to our junior high scientists for showcasing their own projects before heading to State! 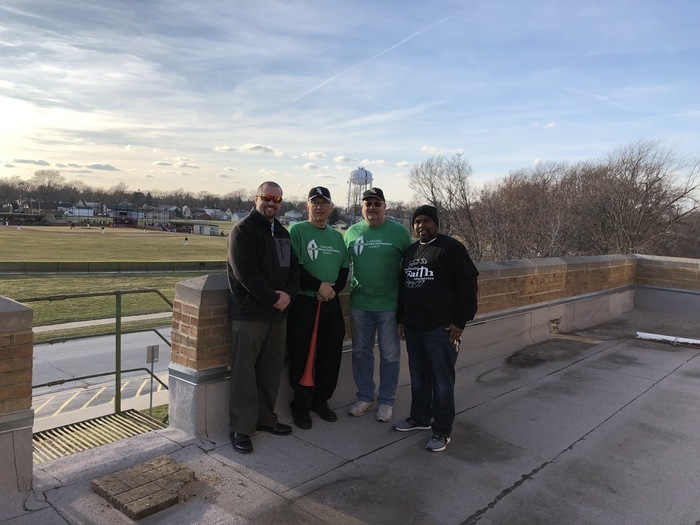 Board Secretary Mr. Wood and Superintendent Dr. Schilling on the roof of First United Methodist Church with Pastor Price (center right) and Pastor Young of Increasing Faith Ministries (far right) for the T. F. South baseball game on April 1, 2019. Memorial Junior High's baseball and softball teams were bused over to watch the Rebels win 11-1! Coolidge construction update! 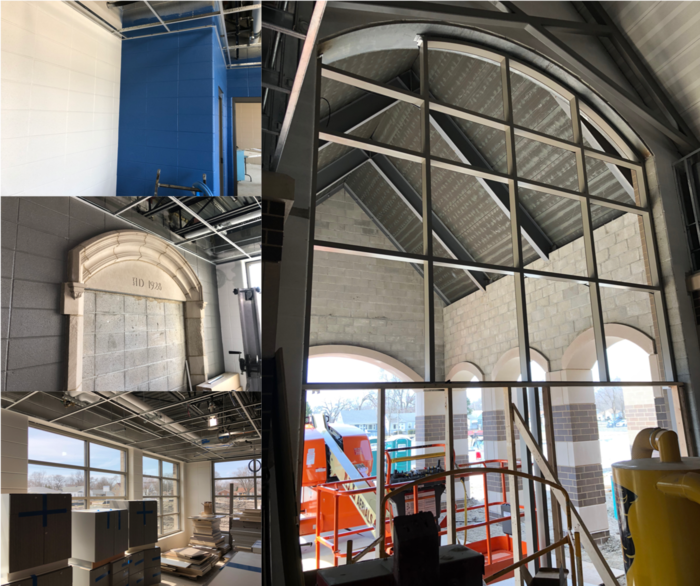 The new main entrance and front office are taking shape with arches and windows installed, furniture delivered, and walls painted in school colors. Our architects continue to respect the history of Coolidge by restoring original stonework inside the new building. 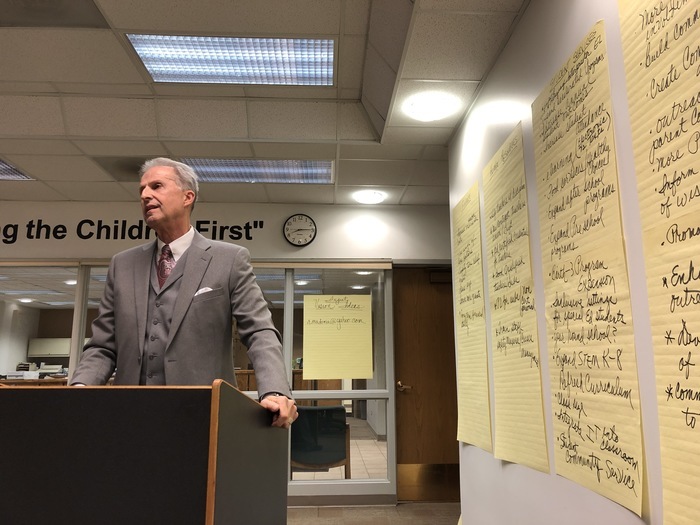 District 158 will be hosting a Business After Hours with the Lansing Area Chamber of Commerce on Wednesday, April 10, 5:00-7:00 PM to showcase this progress. We hope to see you there! Congratulations to District 158's Director of Student Services Dr. Carter, who is being inducted into Sandburg High School's Legacy Hall! This organization awards alumni who have realized their life-long potential and established a positive example for future students. 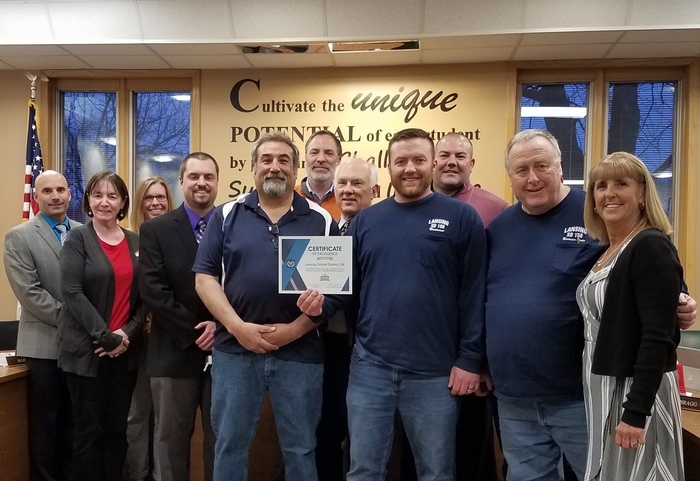 On Wednesday, March 20, District 158's Buildings & Grounds Team was recognized by Dr. Vanessa Kinder, Executive Director of the South Cook Intermediate Service Center (pictured far right), for their work in helping District 158 secure a perfect score on our 2018-2019 facility inspection! South Cook noted that all five of our schools are very clean, well maintained, and conducive for learning. Great job! 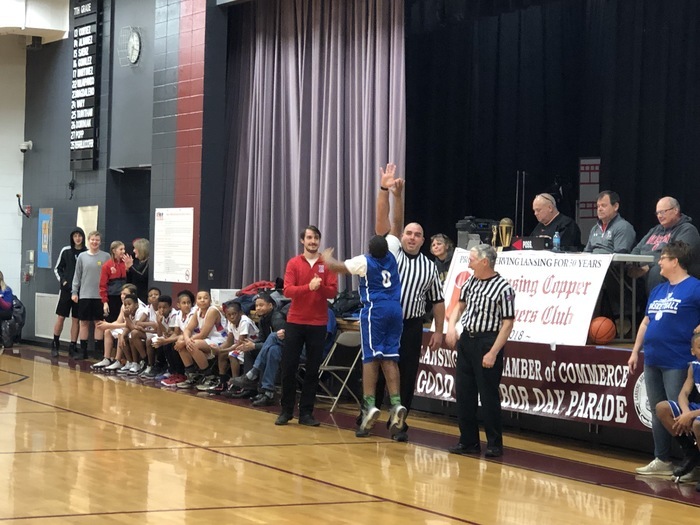 Congratulations to our Coolidge Cougars for winning the 10th Annual Lansing Roundball Classic - finishing the tournament and their overall season undefeated - and Oak Glen fifth grader Jessica Campuzano for winning the Hot Shot Competition! 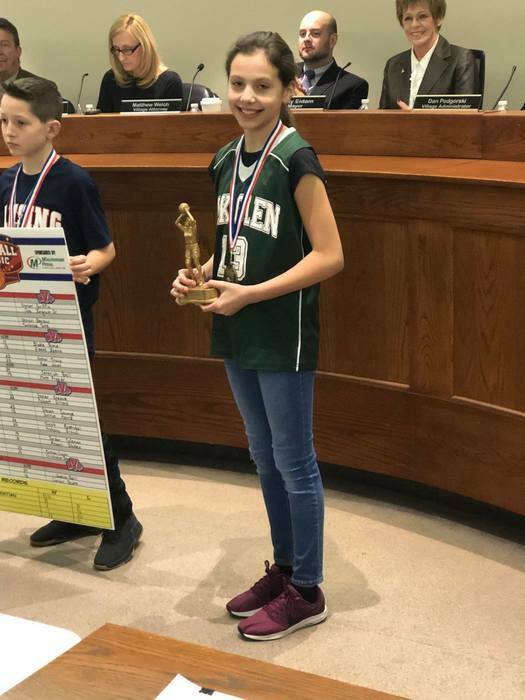 Recognition was provided during the Village of Lansing's Board Meeting on March 5, 2019. 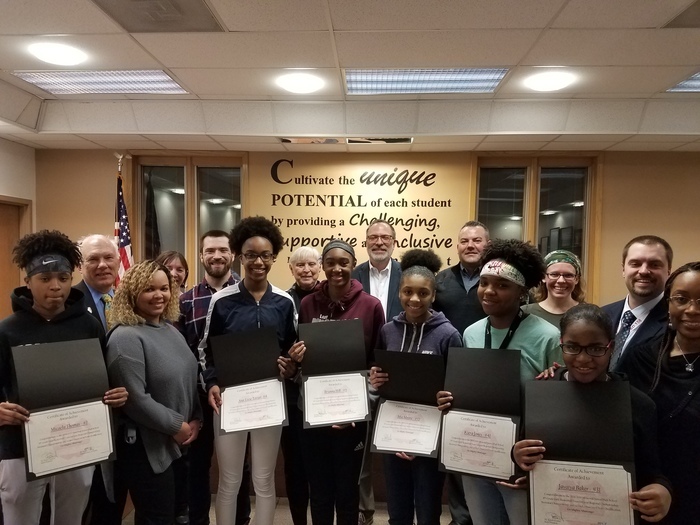 On Wednesday, February 20, our Board of Education recognized Memorial's 8th Grade Girls Basketball Team for their achievements this season. 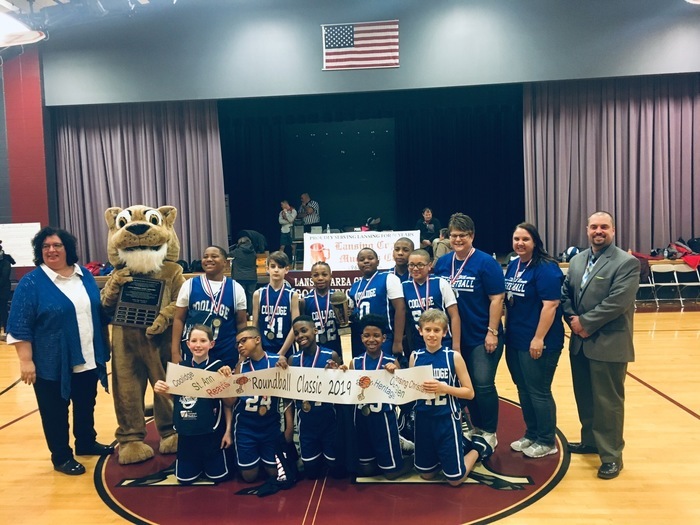 They finished the year with a record of 18-3, averaged 52 points per game, won Regionals and Sectionals, and qualified for State two years in a row. Ana-Liese Torian and Brianna Hill were selected for All-Conference and Javaiya Baker was named the team's MVP. Congratulations girls! Todas las escuelas del Distrito Escolar Lansing 158 regresarán a la sesión el viernes 1 de febrero. 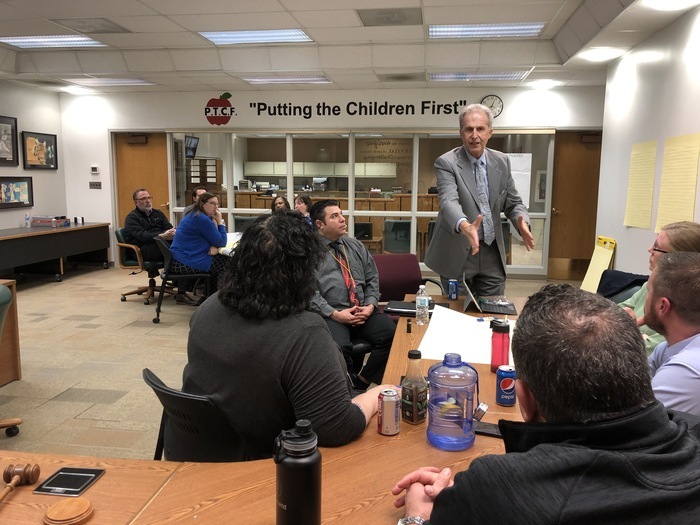 All Lansing School District 158 schools will be back in session on Friday, February 1. 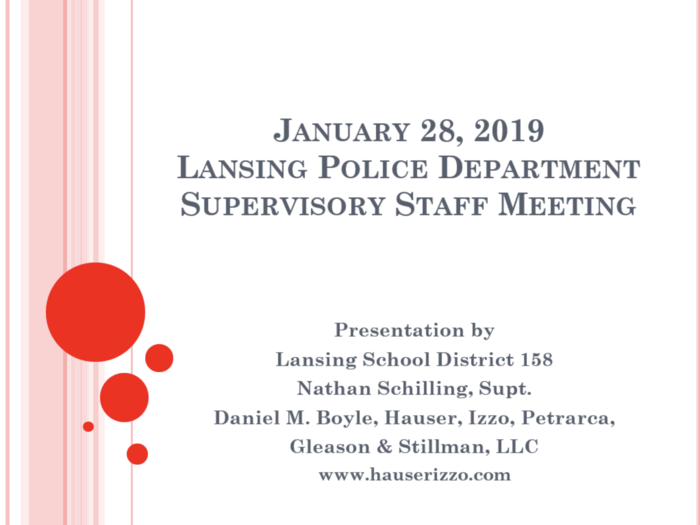 On Monday, January 28, Superintendent Mr. Schilling and District Attorney Mr. Boyle completed a presentation and training with all of the Lansing Police Department supervisors. Topics included legal requirements, student discipline, reciprocal reporting, and parent communication. District 158 prides itself on maintaining excellent working relationships with our local first responders! Por causas de las bajas temperaturas, todas las escuelas del Distrito 158 de Lansing estarán cerradas el martes 29 de enero, el miércoles 30 de enero y el jueves 31 de enero. Todas las actividades después de la escuela estarán canceladas. Due to inclement weather, all Lansing School District 158 schools will be closed on Tuesday, January 29, Wednesday, January 30 and Thursday, January 31. All after school and evening events and activities will be cancelled during this time. 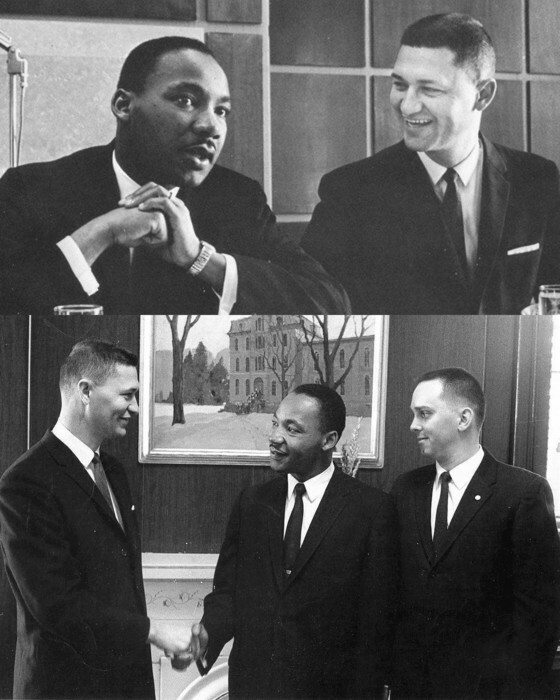 Superintendent Mr. Schilling is remembering Dr. Martin Luther King Jr. today with these pictures from North Central College, which were taken on November 21, 1960 and include his great uncle Dr. Arlo Schilling who was President at the time. Dr. King gave a speech titled "Stride Toward Freedom" in Pfeiffer Hall and asked that Black Americans be treated as full citizens of the United States. How do you remember Dr. King? Happy New Year from Lansing School District 158! Our Board of Education and Leadership Team are here to serve you. 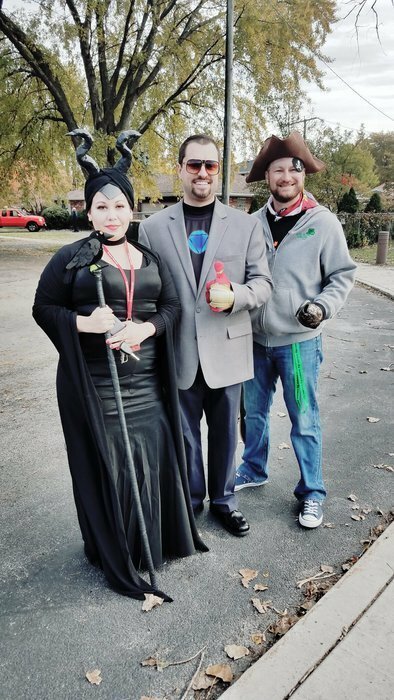 Pictured sitting (left-to-right): Board Secretary Mr. Wood, Board President Mr. Bonifazi, and Board Vice President Mrs. Long. 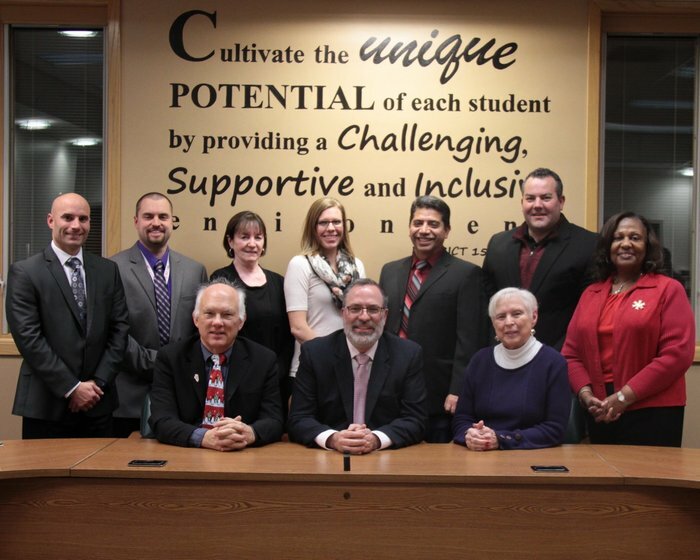 Pictured standing (left-to-right): Chief School Business Official Mr. Crotty; Superintendent Mr. Schilling; Board Members Mrs. Kelly, Dr. Wallace, Mr. Durán, and Mr. Taylor; and Director of Curriculum & Assessment Mrs. Bragg. 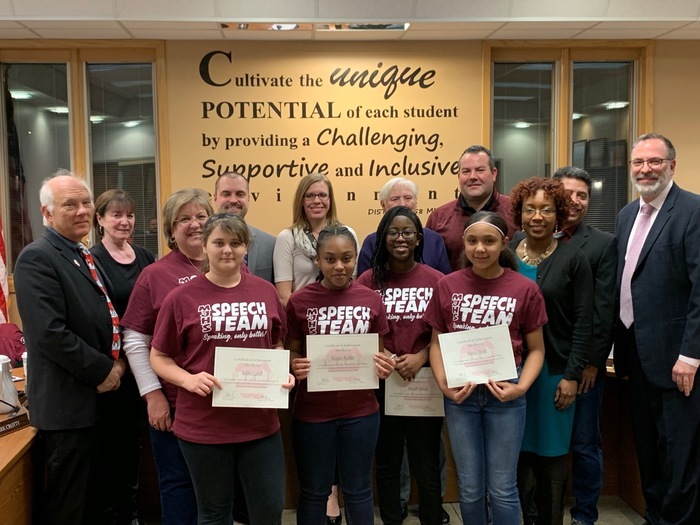 On Wednesday, December 19, Memorial Junior High School's Speech Team was recognized before the Board of Education for their recent success at the IESA Speech Competition. Three students placed first, four placed second, and two placed third in events ranging from acting to storytelling and poetry. 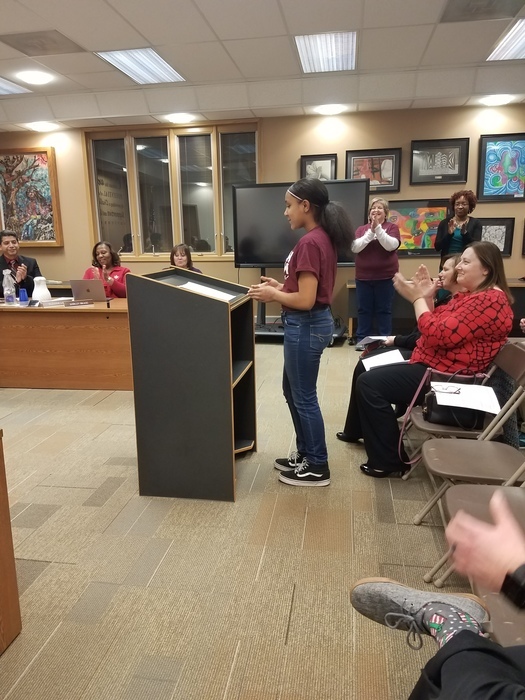 Seventh grader Alexis Dixon read an excerpt of her poem for the Board. Congratulations! 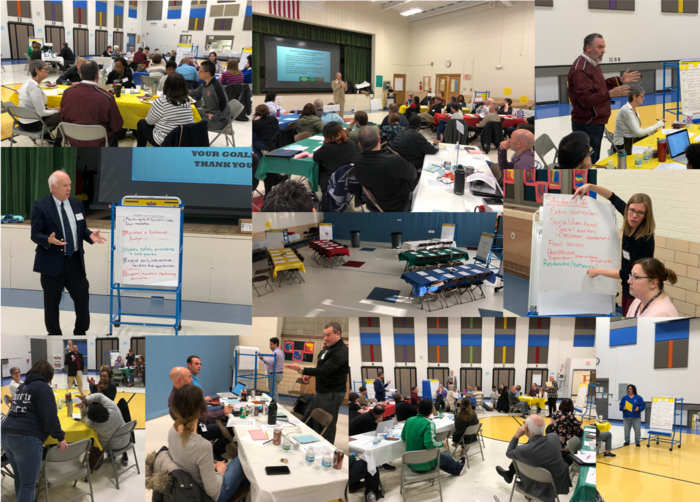 Lansing School District 158 recently completed a presentation on MAP at the South Cook Intermediate Service Center in Chicago Heights. Director of Curriculum & Assessment Mrs. Bragg, Coolidge Principal Mrs. Hodgson, and Reavis Principal Mr. Kostopoulos spoke to other education professionals for 60 minutes on how to use MAP data for Professional Learning Communities, student and team goal setting, differentiated instruction, and teacher evaluation. 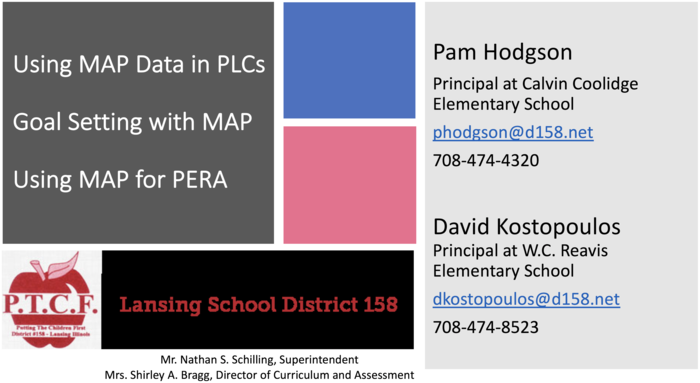 District 158 implemented MAP assessments last year and has been designated a model district in the South Cook region! On November 14, 2018, Board President Mr. Bonifazi administered the oath of office to our newest board member: Mr. Abi Durán (left). The Board of Education, Superintendent Mr. Schilling, and Coolidge Principal Mrs. Hodgson also recognized fourth grader Will Rosenberg (right) for his assistance to military veterans and first responders during Lansing's Autumn Fest. Congratulations! Congratulations to our outstanding volunteers - (left-to-right) Coolidge PTA Treasurer Mrs. Modjeski, Reavis Paraprofessional Ms. Waites, Memorial PTA President Mrs. Enright-Taylor, and Oak Glen PTA Vice President Ms. Stubbs - who were recognized at the Lansing Evening of Thanks on November 9! 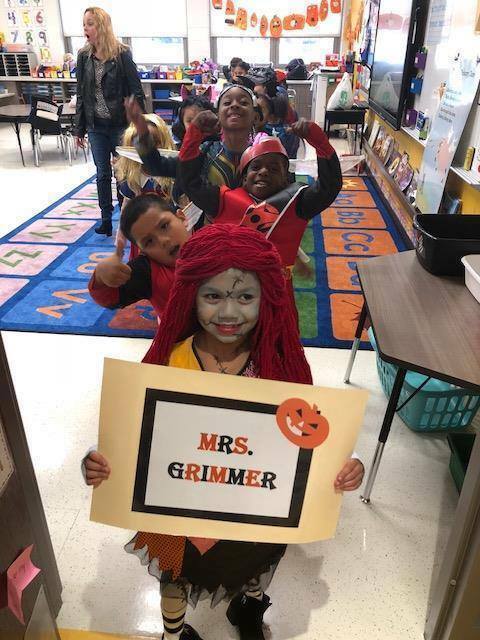 Happy Halloween from Lansing School District 158! 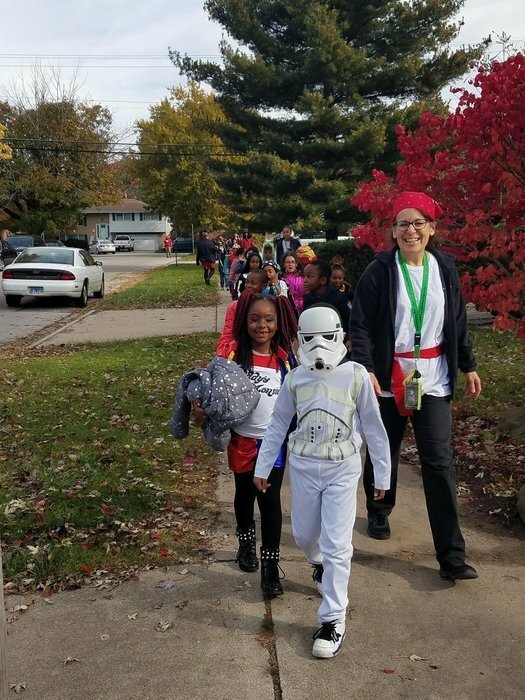 Students at all three elementary schools participated in outdoor parades and shared their great costumes with neighborhood residents. Thanks to all our parents who volunteered their time to help run activities in the afternoon. On Thursday, October 18, Lansing School District 158 held Family Math Night at Memorial Junior High School. 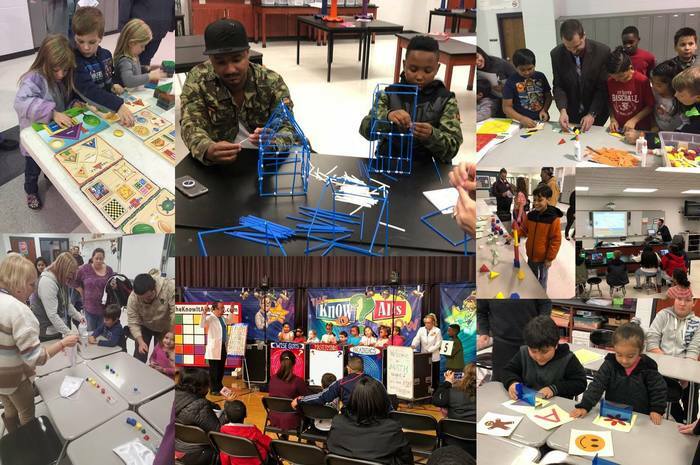 A variety of engaging, relevant activities were hosted for students and parents - including shapes, puzzles, play-dough, 3D design, board games, manipulatables, geoboards, and a live game show in the gym that students participated in. Over 600 people attended the event and families left with suggestions on how they could further their students' mathematical learning outside of school. 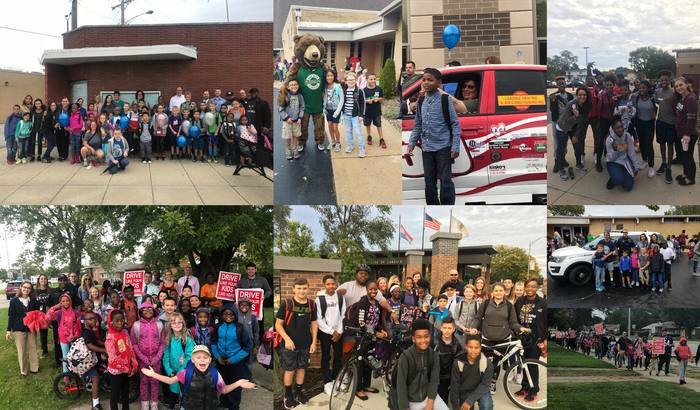 On Wednesday, October 10, Lansing School District 158 participated in Walk to School Day! 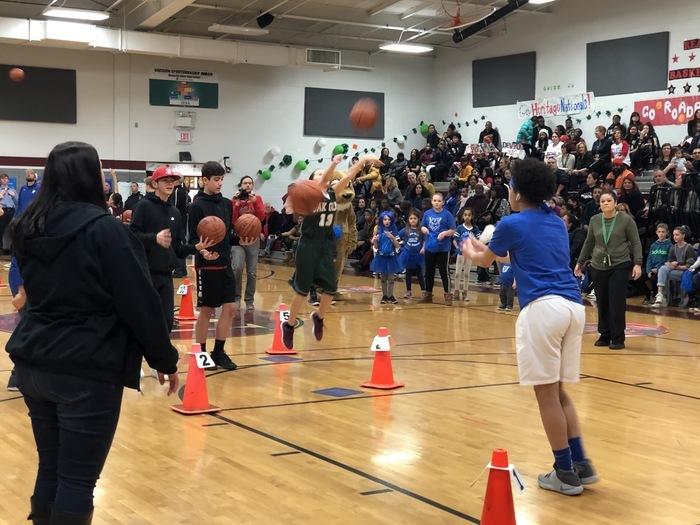 Thanks for the great turnout from our students, parents, school board members, teachers, administrators, mayor, police officers, fire department, and others in the community who helped make this event a huge success! 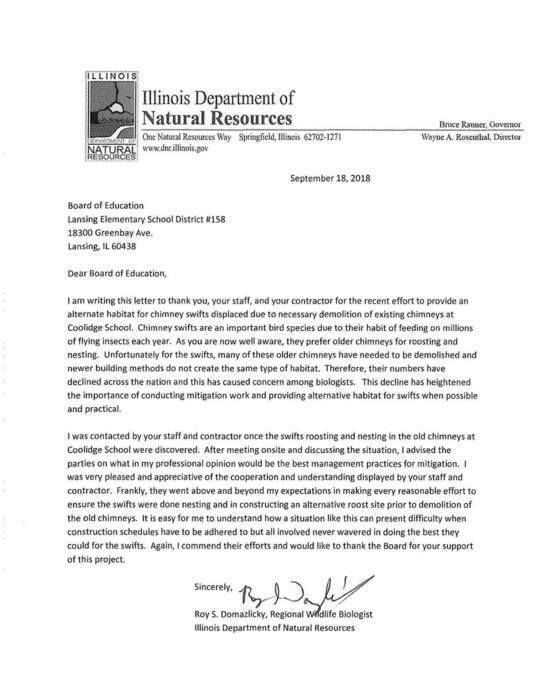 Lansing School District 158 received the following letter from the Illinois Department of Natural Resources regarding our efforts to support the chimney swift birds at Coolidge Elementary School. Thank you to Regional Wildlife Biologist Mr. Domazlicky for his visibility, advice, collaboration, and positive feedback regarding this situation. On Monday, August 27, Lansing School District 158's Time Travelers performed "The Incredible Westward Movement" at the Lansing Public Library. This piece - "Getting Lost In America" by Ron Fink and John Heath - featured a solo by Memorial 6th Grader Esmeralda Spencer as Sacagawea, who helped the Corps of Discovery (played by Oak Glen 3rd Grader Sultan Bellow, Reavis 3rd Grader Andrew Herrera, Reavis 3rd Grader Ian Stubbs). Thanks to Mrs. DiGrispino for directing and the Lansing Historical Society for hosting the event! 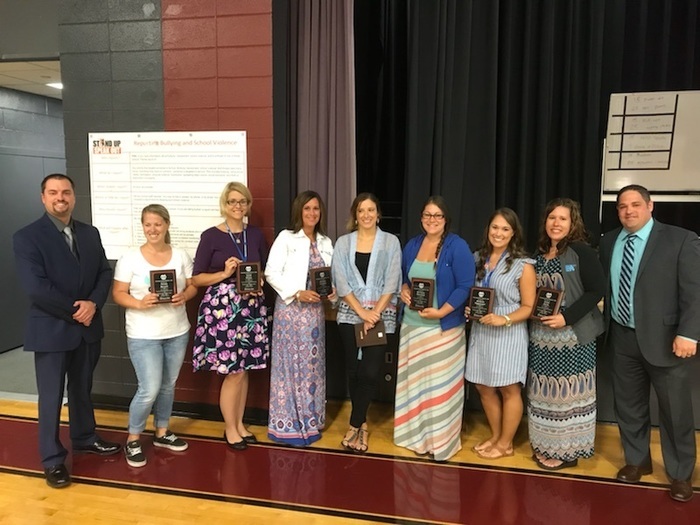 During yesterday's Opening Teacher Institute, Superintendent Mr. Schilling (far left) and Horace Mann Representative Mr. Donley (far right) recognized seven Lansing School District 158 faculty members who received tenure this year: (left-to-right) Memorial PE Teacher Mrs. Bersell, Coolidge 5th Grade Teacher Mrs. Wiora, Coolidge 2nd Grade Teacher Mrs. Sannito, Memorial 7th Grade ELA Teacher Mrs. Flaherty, Reavis 4th Grade Teacher Mrs. Martinez, Oak Glen Social Worker Ms. Toppmeyer, and Oak Glen 4th & 5th Grade Co-Teacher Mrs. Joria. 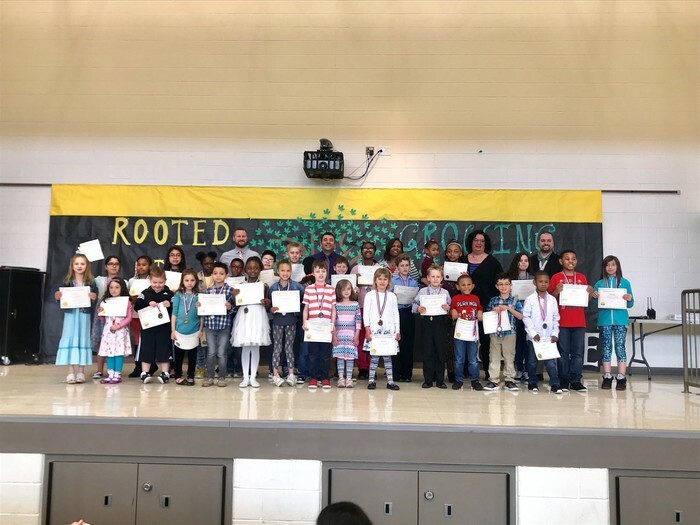 Congratulations to our educators on achieving this career milestone!